In my experience, Jumper installation appears as the most difficult issue to study in this trade. Probably, this result from the fact, that apprentices and even experienced installers cannot understand how to turn elbow's parts over the right way and cannot remember the sequence of execution of work. 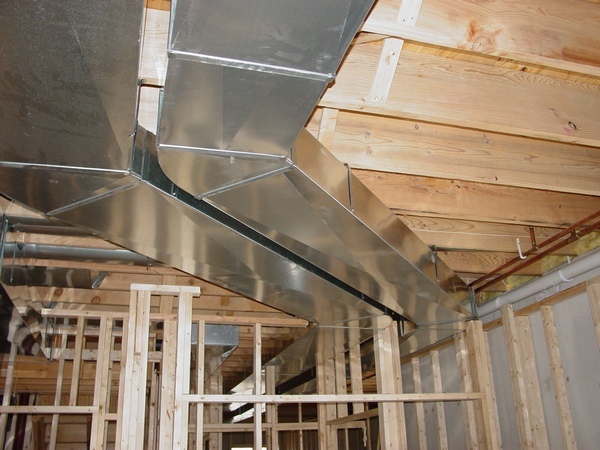 Every profession has its own tips and tricks and the profession of the ductwork installer has them as well, a lot of them! On this and on the following pages I would like to introduce forty one topic dedicated to this issue. The price for any tip or trick is only $1.00 and if you decide to purchase all 45 of them at once you can do it just for $9.99 and save! 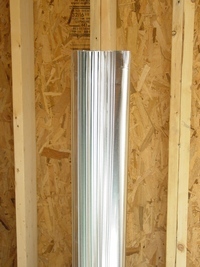 Sometimes, when you’re replacing an old furnace, the existing plenum is larger than a new furnace just for 1”. In this case you may avoid making a new plenum but unfold one of the flanges on the existing one and screw it right to the side. 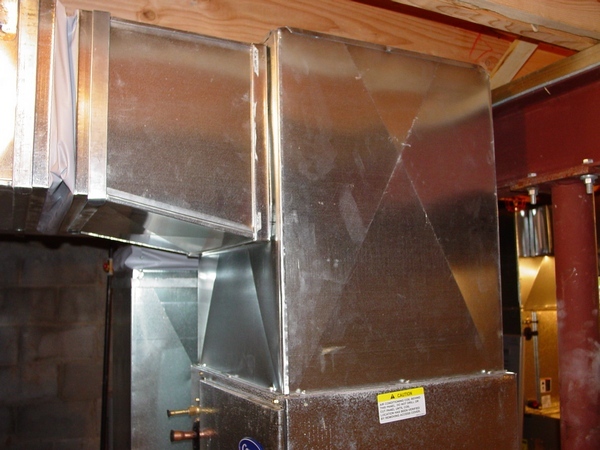 However, as you can see it in the picture, the unfolded flange isn’t long enough to be fastened to the furnace jacket. No problem! I resolved this issue in 5 minutes! If you need the answer click on the "Buy Now" button below and get step-by-step instructions instantly only for $1.00! 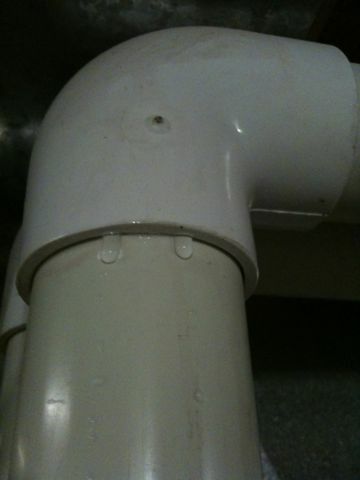 Last week I was working in the basement doing heat runs, when I found out that I’m out of 6” elbows. After searching in boxes I found a couple, but they were broken. It was what I needed! In matter of seconds I fixed it and get the job done! The other day I was running 6” heat runs in the floor trusses and it was a pretty difficult job. The distance between trusses was only 8” – 8 ½” and trusses themselves were made from 2 x 4 so they were 3 ½” wide. But anyway I’ve managed to run 30” long pieces of the pipes through! So, here is one little trick which helped me to make the job done! For the price of only $1.00 I can explain how it should be done! Recently my boss sent me to do a minor repair in Ann Arbor, MI. He called on my sell phone and said that a 6” round pipe in a house that we finished two month ago was smashed and I had to replaced it. He asked if I have any materials, I checked it out and found a bundle of 6” pipes in my truck. One hour later and 45 miles away from any supply house I found out that actually it was 7” pipe! 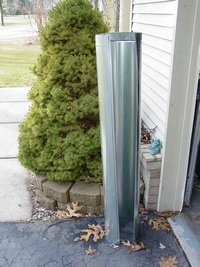 I came back to my truck and found a piece of 7" pipe 4’ long, but I needed a five footer! After using several words one of them just four letters long toward a superintendent who couldn’t tell a 6” from 7” pipe, I made a 15” long piece of 7” pipe from 6” pipe in less than a minute! An answer to this question would be very useful for DIY-er and also for anyone working in the ductwork installation field. 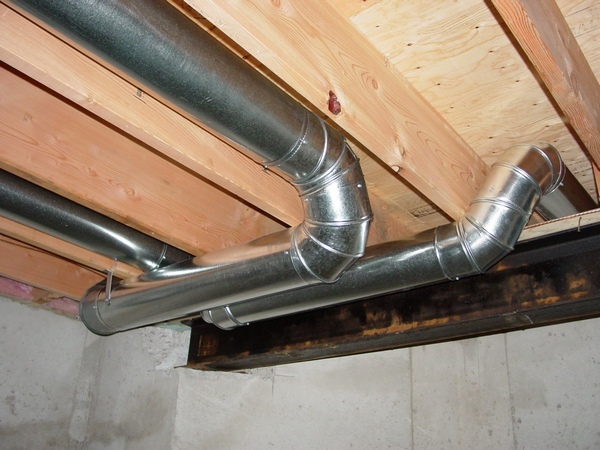 A simple knowledge how to reduce or increase size of the duct can save you some time and help you to finish a job on time! So, for the price of only $1.00 I can explain how to do that. In order to figure it out you are not supposed to be a super tin knocker, anyone who has C and higher - for geometry is able to solve this problem. I’ve resolved it in 5 minutes! An answer to this question appears to be a very difficult one! You can do a research on the web as did I and find a very strange explanation with tons of geometrical formulas, which even I with my college degree couldn’t understand! Moreover, I can’t understand how an ordinary tin knocker can use those stupid formulas in the field anyway! So, for the price of only $1.00 I can explain how to do it. What you can see in the picture is a “jumper”. 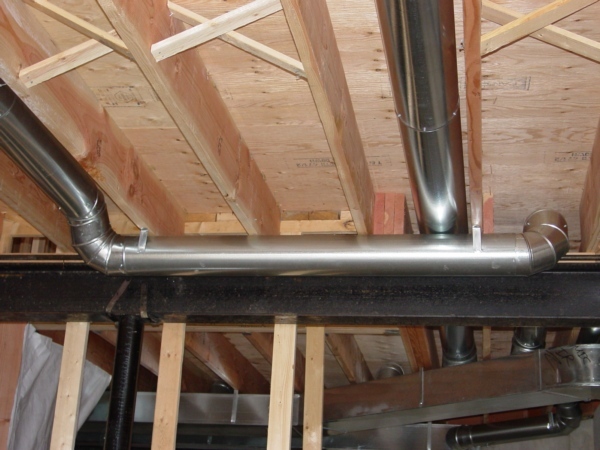 When I ran a pipe from the joist space on the right to the joist space the left, I didn't even have a pipe there (in the joist space on the left). 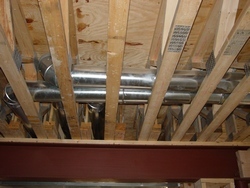 But anyway I have managed to make the right measurement and placed a pipe in the middle of the joist space. For a reason unknown to me a "jumper" always is the most difficult part of the trade, check for example this one out, and from my experience I know that not too many tin knockers know how to calculate a "jumper" the right way. So, for the price of only $1.00 I can explain how to do it. Recently I was working in the basement, doing heat runs, and probably I was thinking too much on how to improve my website! 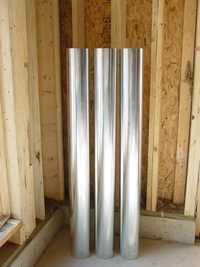 As a result I put together too many six inch pipes – nine of them. When the job was done to my surprise I've discovered nine extra pipes all over the basement. I said to myself – it’s not a big deal! In less than a minute I took them all apart and put them back in a bundle! This one is funny! 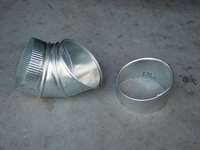 Recently on one of the Forum websites one of the visitors asked how to unsnap a pipe. Any of you should have read the answers, one of the EXPERTS even recommended to use a grinder to cut the pipe in pieces, another suggested - just throw them away and buy some new ones for only $7 a piece!!! But you are going to be astonished on how incredibly easy it actually is to unsnap a pipe! So, for the price of only $1.00 I can explain how to do it.